A few months ago I started doing my grocery shopping once every two weeks. This means that I do ALL of my grocery shopping every other weekend (while the kids are with their dad), and I try to avoid making any other store visits during that two-week period. One of the concerns I had when I decided to first try this was that we would run out of food to eat. As it was I was going to the store every week, and the kids would complain “there’s nothing to eat”. What this really meant, though, was that there was nothing they wanted to eat. My kids have been pretty spoiled. They are accustomed to having TWO sugary bedtime snacks every night. It took a little trial and error to get an idea of what two-weeks worth of food would be. A favorite snack one week is out of favor the next. All of the good fruit and the favorite snacks start running out around the start of the second week. Sometimes the dinners are cobbled together the last few days. However, there is in fact still a ton of food left in our house even when “there’s nothing to eat”. 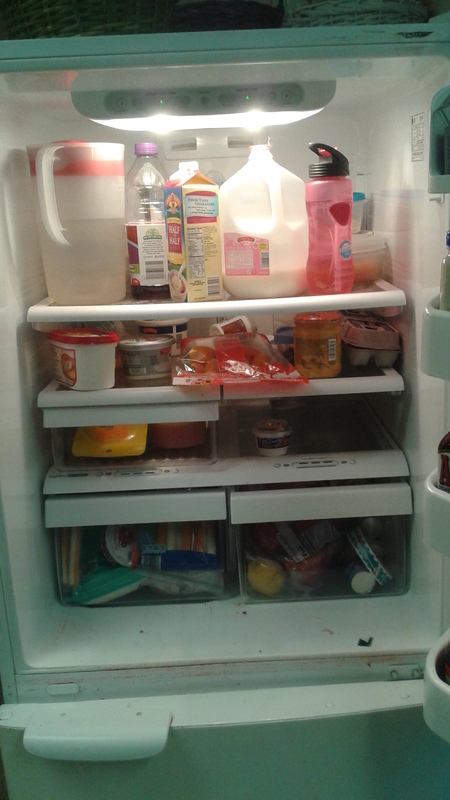 For example, here are some pictures of our food supply on a Friday before a grocery shopping weekend. Disclaimer #1: Yes, my family eats a ton of processed food. It’s my choice how I “poison” my kids. Disclaimer #2: Yes, I know this would probably be an optimal time to scrub down the inside of the fridge. But it probably won’t happen. This is my tall and narrow pantry. On the top shelf there are six boxes of cereal (three that the kids will eat). As you can see we still have a few bags of chips left. 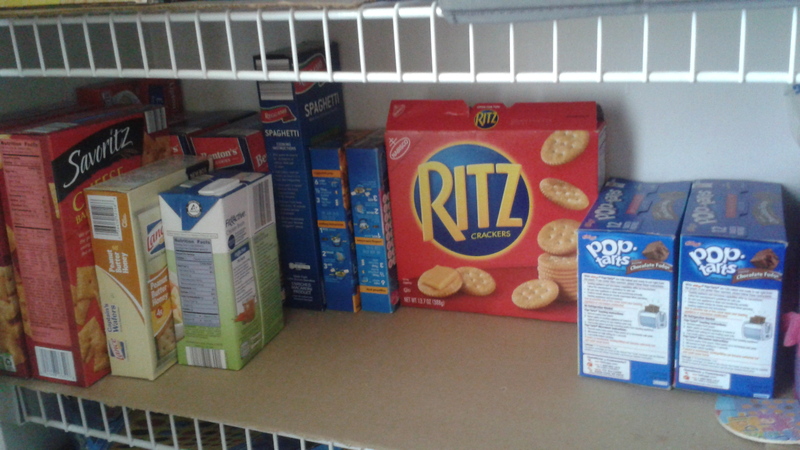 The middle shelf has Cheeze-Its, Animal Crackers, and Ritz crackers. 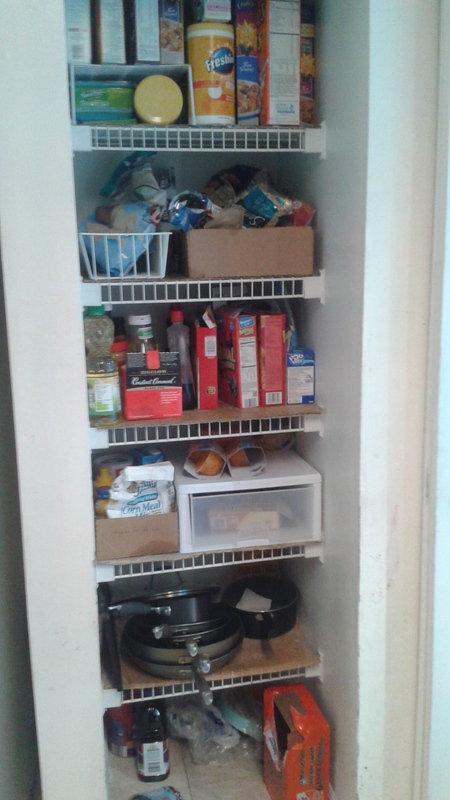 The snack drawer (shelf above the pans) still has a few packs of peanut butter cracker sandwiches and fruit & grain bars as well as fruit cups on top. A bottle of juice, a quarter bag of potatoes, and Ramen noodle cups are on the floor. The cabinet under the island still has boxes of Kraft macaroni and cheese and Velveeta shells. There are Pop Tarts and saltines, cans of tuna and a jug of rice. There’s chicken broth and four types of pasta (spaghetti, rotini, penne, and macaroni). 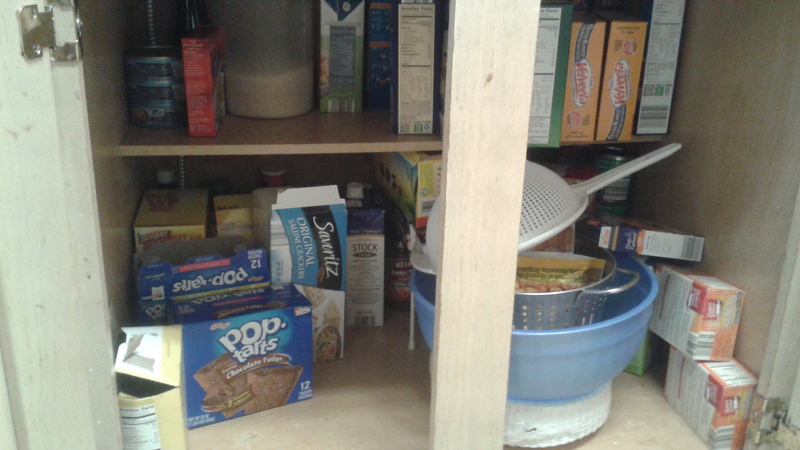 This is my “upstairs pantry” where I store extras. You can see more macaroni and cheese, Pop Tarts, Cheeze-Its, spaghetti graham crackers, chicken broth, and peanut butter cracker sandwiches. Disclaimer #3: I didn’t take a picture of the cabinet where I keep baking staples and my two remaining boxes of dessert mix (brownies and cheese cake). We’re running low on skim milk in the refrigerator, but there’s a quarter gallon of 2% behind the water jug. There are a few eggs, bologna, cheesy hot dogs, two yogurt cups, nacho cheese sauce, and a pound and a half of bacon. The left drawer still has at least four, half-full, 12 oz bags of shredded cheese and two bags of cheese sticks. The right drawer has a bag of apples and two bags of carrots. 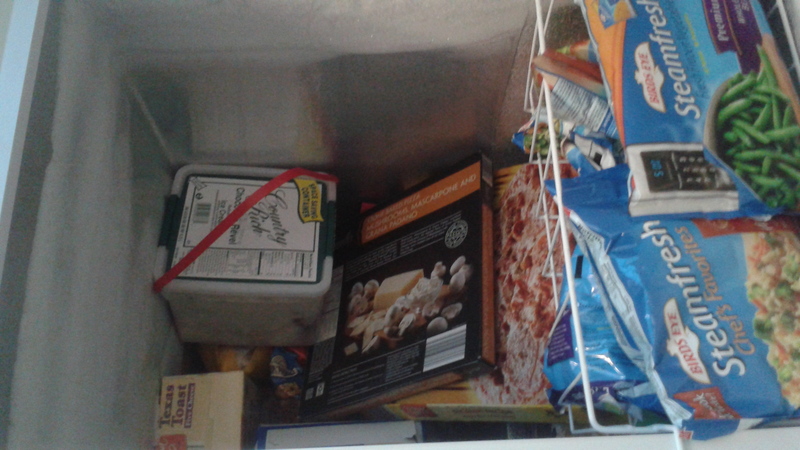 The freezer still has one medium-sized cheese lasagna, garlic cheese toast, french fries, french toast sticks, pancakes, chicken tenders, and fried beef ravioli. Oh, and that quart of chocolate ice cream is mostly full. Inside the chest freezer is an extra box of garlic cheese toast, a couple of frozen pizzas, a half gallon of ice cream, lots of Steamfresh vegetables, and way down in there is a whole chicken. I didn’t take a picture of the mini fridge, but it has one carton of half & half left. 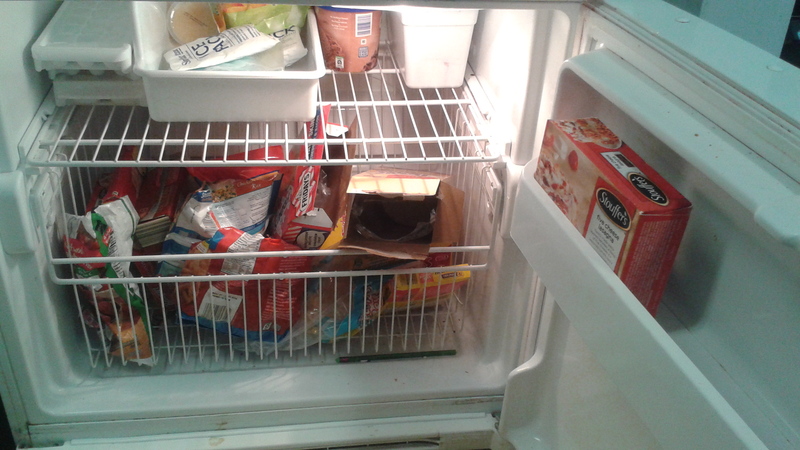 So, as you can clearly see, since it has been two weeks since I last went grocery shopping…THERE’S NOTHING TO EAT! I realized that we would not in fact run out of food if I only went grocery shopping every two weeks. Like most people I tend to over-shop beyond our basic needs. Sometimes this is intentional (when I take advantage of a good deal), and sometimes it’s pathological. I also think that I’ve learned lessons as well. I’ve learned to plan better, and I’ve learned to make do with what we have. For instance, the week these pictures were taken we ran out of some of the kids favorite bedtime snacks, so I fired up the oven and used mixes to make pumpkin muffins one night and brownies another. I’m not going to say that I never make an extra trip to the store. Some weeks I’m scattered brain and forget half the things written on my list, or a gallon of milk goes sour unexpectedly. But now I stop and think about if I really need to make an extra trip to the store or if we can try to do without for a few more days when “there’s nothing to eat”. This entry was posted on January 31, 2015 at 11:09 am and is filed under Family Life. You can subscribe via RSS 2.0 feed to this post's comments. You can comment below, or link to this permanent URL from your own site.